Season's Greetings from our house to yours ! 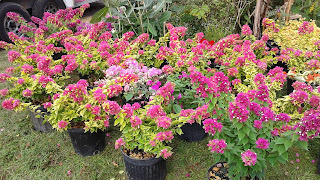 This coming weekend at Saturday Morning Market, we will be having a huge Sale on Bougainvillea bushes! Not just any bougainvillea, but the one and only "Miss Pixie"
....not only is she a dwarf variety (which is perfect for those who don't have a lot of room), she have striking variegated leaves, practically thornless and just blooms and blooms all year in sunny locales. 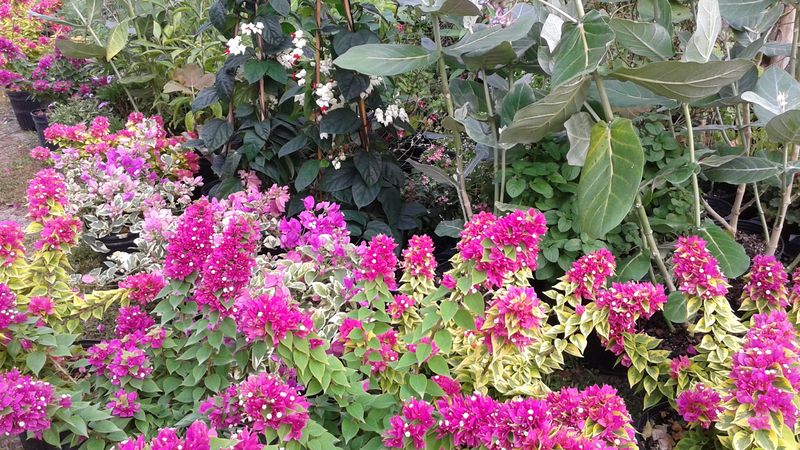 We also we have a few non-variegated types, along with Boug bushes in purples, pinks and oranges. 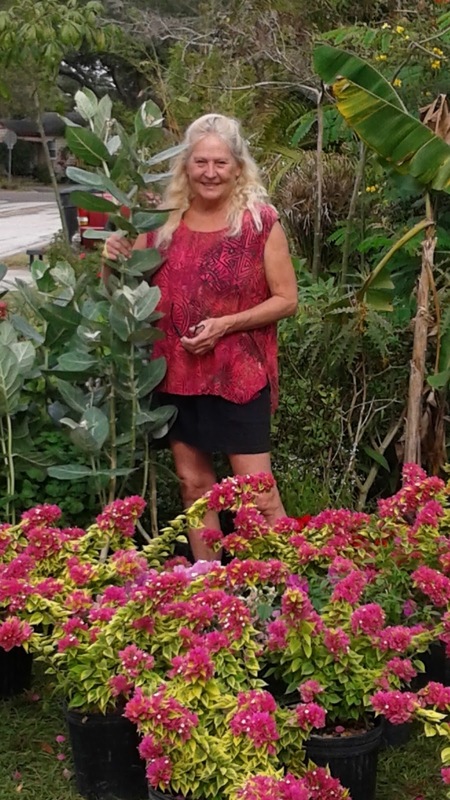 Also, at left, Annie is standing next to one of our favorite butterfly bushes, the lavender flowering Giant Milkweed which is in full bloom and bud right now. This Saturday at Market, with it following the day after Christmas Day, is one of our favorite days as the hecticness of the holidays is winding down and people are relaxed and ready to be out for a good time...not to mention, spending that Christmas money ! Market will also be open the day after New Years...which means, enjoy New Years Eve on Thursday night, relax and recover on Friday, than hit the Market on Saturday to help us bring in 2016. Yikes ! 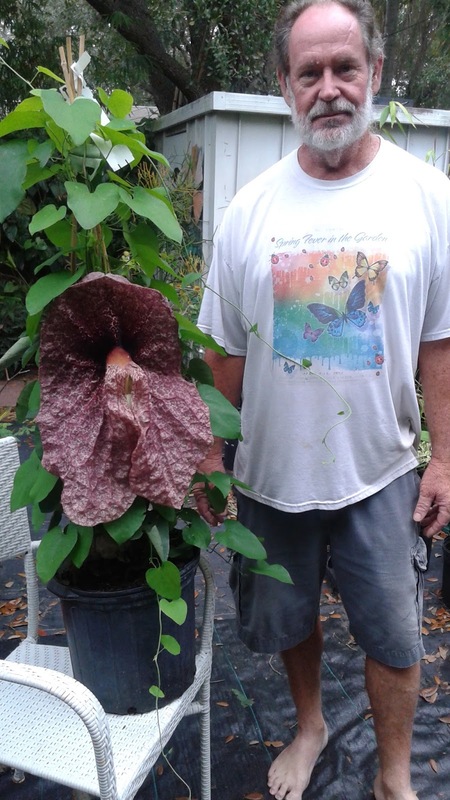 Yes, you are looking at an Aristolochia bloom.....that is one GIANT Pipe Vine Bloom! 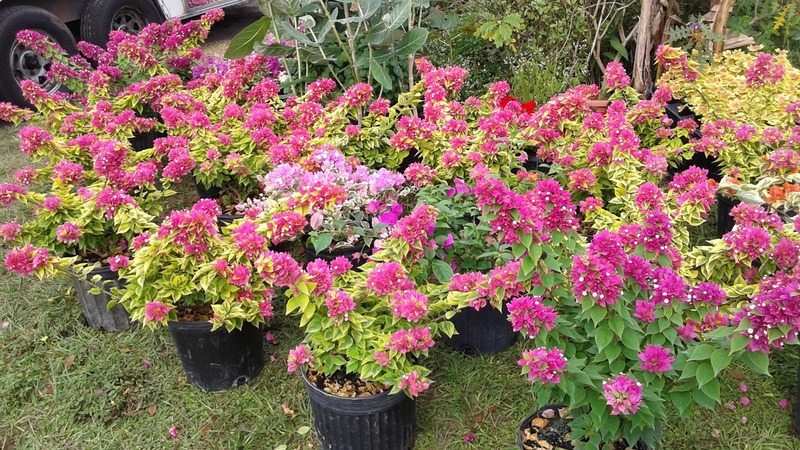 You might be aware that we always carry the regular Pipe Vines for sale because they are an awesome host and food plant for butterflies and their larva and caterpillars. This one is from Mitch's private collection, and is quite spectacular. As Mitch is 6 ft tall, you can see the bloom is 1/3 his size ! We hope everyone enjoys their holiday and we hope to see you soon. Many thanks to all the loyal Market customers that help keep us, and so many vendors, going....going LOCAL that is !